The Festival of the Elephant God – Ganesh Chaturthi: a ten-day festival that begins on September 13th. Regardless of where you’re from, let’s all celebrate this festival by making sure we don’t support the abuse of elephants. Over the summer, I visited Amer Fort in Jaipur, India – a beautiful UNESCO world heritage site with red sandstone walls, intricate architecture, and a majestic palace… but alas, right in front of its exquisite exterior exists animal abuse. 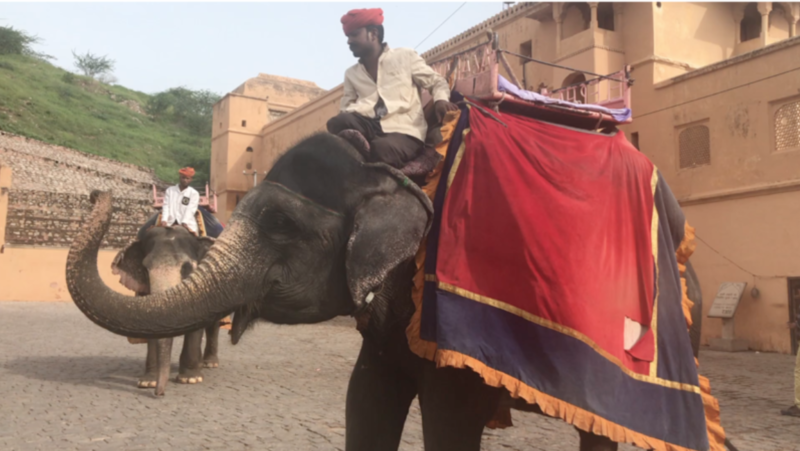 Here, many tourists book an elephant ride so they can feel royal… like the Maharajas and Maharanis who inhabited the fort in the 18th century. However, this poses the question, is it really royal for people to force these sentient beings to trudge along in the sweltering heat every single day? According to PETA, although elephants are one of the largest animals in the world, they are amongst the most abused. Supporting elephant rides isn’t royal… it’s cruel. None of the elephants are registered with the Animal Welfare Board of India which is a violation of “The Prevention to Cruelty to Animals Act”. It has been proven that trainers whip the elephants, poke and prod them into submission, paint traditional patterns on their skin, and chain so they cannot move freely, causing both physical and mental trauma. Although the Indian government has passed rules, regulations, and restrictions on elephant rides, the question remains: is it right to allow these rides to even exist? It is true that many elephants have been rescued from hard labor and brought to Amer Fort. But is it right to take the elephants out of one harmful environment and place them in another? Elephants are not vehicles. Their body physically isn’t made for walking on stone, being steered like a car, or being confined in small stables. They aren’t canvases to appease human eye. To everyone at ISKL, we can all take action against elephant cruelty. Celebrate the Festival of the Elephant God by signing this petition to encourage the creation of an elephant sanctuary to rehabilitate the Amer Fort elephants in Jaipur. We must speak up. We must take action. Let’s all act like true royalty and protect the elephants of Amer Fort.